A Literary Odyssey: My Victorian Celebration Reading Plans. 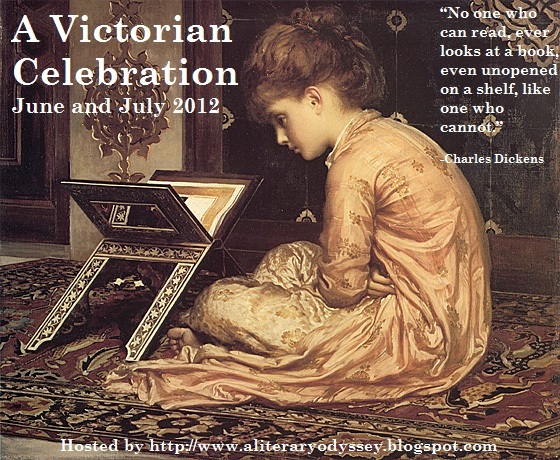 So...A Victorian Celebration starts in TWO days. Where has the time gone? Anyway, I'm trying to decide what to do for the event in regards to my reading. I am currently in the middle of a number of titles that are certainly NOT Victorian in nature. And while I wasn't planning on focusing solely on the Victorians for all of June and July, I do need to switch gears a bit. I think I may set aside a few of the titles I am in the middle of in favor of picking up a Victorian or two...or three. We'll have to see how voraciously I pick up books when I am free (at last) from the demands of teaching (although, I finished my last set of essays yesterday, so that frees up a TON of time in the evenings). I thought it would be a good idea to make a list of all the Victorian books that I have on my shelf as options for the event. I have them listed below in some categories. I am looking for suggestions in a couple areas, so please, recommend! Any others I should think about as options? I know I don't have a lot of diversity in authors-hardly any by the lesser-known Victorians. I'm open to suggestions! I'd really like another biography on Hardy if anyone knows of a good one! Obviously, I know I'm not going to get through all of these titles (THAT would be crazy), but I do want to make some great progress. What are you planning on reading for the event? Oh, wow. I had planned on reading The Mill on the Floss, and maybe Wuthering Heights - now I need to find where I put them! Mill on the Floss is SO GOOD. Can't wait to see your thoughts! Yes, that's my favorite Hardy. So far, anyway. I hope to read Far from the Madding Crowd sometime this year. Tess was pretty good as well, and was my first Hardy. Took awhile to get into (like 100 pages or so) but was well worth it in the end! Good luck with Agnes Grey. I think I've said this before (?) but that's one of those books that some people love and others hate. If you do end up in the latter category, or if you just don't find it as spectacular as you like, I still highly recommend Tenant of Wildfell Hall as it's completely different. In my opinion (and Jason's as well - one of the rare places we agree when it comes to classics), Tenant is a far superior book. I have really loved the Hardys I've read, so I want to read more. I wouldn't be surprised if I read all three. I definitely want to get to Tenant soon, but I've heard it is the better of the two, so I want to save it for later (that make sense? I always feel silly saying I want to save books). A lot of overlap on our lists! I also want to read the Dickens biography, Agnes Grey, and maybe Return of the Native. I'm hoping to knock out some of the shorter Victorians on my TBR shelves. If you do end up in the mood for something longer, I highly recommend Wives & Daughters. It is long but I found it an extremely quick read for a Victorian. Same for North and South. A Tale of Two Cities is a good choice for a shorter DIckens. It would be a small miracle if I get all of these finished in two months, but I can dream, right? Lots of books that I haven't heard of! I'll definitely have to look into some of them. :) I know you're a big Trollope fan...what title comes before Barchester Towers? It's The Warden. The shortest in the Barsetshire series, though not the best. It starts out slow but gets better. I only recommend it because Barchester Towers makes much more sense if you read The Warden first. I think it's less than 200 pages, so not a huge time commitment. Jerome K. Jerome wrote the wonderful Three Men in a Boat, and this is a similar book, about a train trip to Germany. The Carlyles at home is a nonfiction book about Thomas Carlyle, the famous Victorian. Of course Zola is French, but it's the same time period, so it'll be fun to read a different perspective. OK, The Warden is about 250 pages. But still, quite short for a Victorian! I just ordered a copy. :) Thank you! Wow, that's quite a list! Even if you only read a tiny portion of it that would be awesome. From what I've heard, Lord Jim is much more fun than Heart of Darkness (which I loved). I haven't read it, but from what I can tell it's more of an adventure story. Thomas Hardy's poetry is really quite wonderful. I recommend Hap, Neutral Tones, and The Darkling Thrush, but just browsing through a collection of his poems can't be a bad thing. Good to hear about the Conrad title. I wasn't a fan of Heart of Darkness any of the times I read it, so hopefully Lord Jim will be a positive experience. Thanks for the recommendations! I have a complete collection, so I will make a note to get to those ones! As a new book blogger, and a music historian with no collegiate training in literature, can I ask a silly question? How is "Victorian" defined? Does it encompass all books within a certain time period? Or is it perhaps a genre of books with similar style, theme, or treatment? That's a great question! Victorian literature usually refers to the literature that came out of England during Queen Victoria's reign (1837-1901). A lot of the big names were writing during this time period (Dickens, the Brontes, Trollope, Eliot, etc). Whenever I say Victorian lit, I am just referring to books published in that time period in England. Some people also include American writers during that time period as Victorians as well (thus, my Twain reference up there). And while they were certainly writing in the time period, they weren't in that big literary group in England, so technically they aren't really Victorians (but they can still count for the event). Thank you! And yes! I have a big question, which again stems from being so new to this. I want to be involved in this conversation! How do I take part in your Victorian Celebration? Do I read a book and then comment upon it here on your blog, or on mine? I'm a quarter of the way into Gaskell's amazing Wives and Daughters, and also have her Cranford, Collins' The Woman in White, and Stevenson's Treasure Island just waiting for me on my shelf. This event is such a wonderful idea - there's so much to dive into in those lovely old English novels. If you click the link near the beginning of my post, it'll take you to the sign up page. There's lots of information there that you can look through. Starting on June 1, I will have a master post up on my blog for people to submit links through (through a Mister Linky widget-it's pretty self-explanatory). Whenever you write a post related to the event, you fill out the linky and it will link your post to the master list. I'll be handing out prizes during the event, and there will be guest posts and other giveaways too! Please join in! I'd love to have you. I'm definitely reading Little Dorrit since I'm beginning a class with that book on June 19. I'd like to read Mill on the Floss since I started that for another class and never finished it (though I know how it ends). I do recommend Tenant of Wildfeld Hall and North and South. Have you read Lady Audley's Secret by Mary Elizabeth Braddon? A total romp and a very quick read. I also recommend Hester by Margaret Oliphant. I have Little Dorrit in mind for a future Dickens read. :) And Mill on the Floss is by far my favorite Eliot. LOVE IT. I've read North and South before. SUCH a great book. The mini-series is awesome as well. Thanks for the other suggestions. I will definitely add them to the list! Today I brought home from the library The Teaching Company's Great Courses lectures on Victorian Britain. Not exactly an audio"book", but I'll get 18 hours of lectures on the whole era. I am planning to read A Tale of Two Cities first; it's one of my favorites. I am also planning to pick up a couple Bronte works and I have A Wilkie Collins on the shelf I might read as well. I've always wanted to read Tenant of Wildfeld Hall and North and South. I may have to track them down one way or another by the end. I'm hoping I get to Tale of Two Cities, but there are some others I want to get to more. My only Wilkie Collins experience was The Woman in White, which I adored, so I have high hopes for his other work. North and South is fabulous. And the mini-series by BBC is also quite amazing. It makes for great rainy day watching. I'm still planning to read A TALE OF TWO CITIES (beautiful Penguin!) but Heather and I are planning to read The Secret Garden together. It's really on the edge of Victorian -- published after Victoria's death but dealing with the Victorian period. I just read The Secret Garden for a readalong-my post will be up tomorrow! Such a wonderful book. And I hope you enjoy A Tale of Two Cities. I haven't read it yet, but I'm looking forward to it! I tried Middlemarch a while ago but just wasn't interested enough to get past the first chapter. I'll look forward to following your posts about it. Maybe consider Frankenstein and Madame Bovary. I've read both recently and really enjoyed them. I think they're considered Victorian . . .
Middlemarch takes a little getting into. It's so big and complex that you almost need to plow through 100 pages to get hold of it, know what I mean? Both Frankenstein and Madame Bovary are two of my favorites. I don't think I'll have time to get to them for this event, but they are definitely up for rereads in the future. I'm beginning the celebration with Dickens/Our Mutual Friend and Eliot/The Mill on the Floss. For a biography of Thomas Hardy I recommend - Thomas Hardy: The Time-Torn Man by Claire Tomalin. I had to read Uncle Tom's Cabin when I took an American Lit class after I graduated from college. It was REALLY good and I enjoyed it - it's a pretty easy read from what I recall. I need to get to the library soon to get some chunky books for this summer. And my ereader does have a bunch of Hawthorne and Victorian sensation novels! Also Madame Bovary is waiting for me, but I'm planning to participate in a read-along with that one and I don't know exactly when it starts. We're also reading some non-fiction, fiction written in different periods but set in the Victorian period, poetry and possibly other books that we might find irresistible along the way. Just making up lists for this event is so much fun! I can't believe it's almost June, either! I'm finding that I'm pretty much shelving all earlier plans in favor of what's striking my fancy right now. I have to say, I can't really think of who the less well known Victorians are. I think the "big" names are so dominant and prolific, it's hard to get past them. Looking forward to the event! What about The Autobiography of Mark Twain (or did you read that already?). I still haven't gotten to mine... gah. I might be reading Agnes Grey in a few days, too. Oh, might I also suggest some favorite authors I don't see listed... either for you or anyone else participating? Melville (Especially The Confidence-Man: His Masquerade) - Melville is a Victorian-era writer, although his works are more Edwardian in nature.